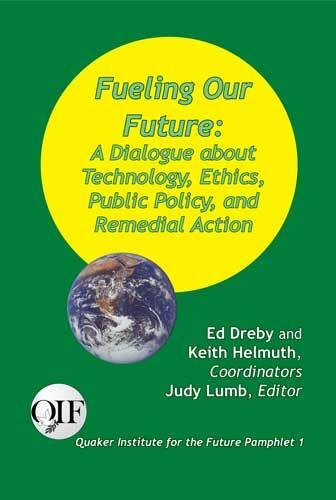 Fueling Our Future: A Dialogue about Technology, Ethics, Public Policy, and Remedial Action was compiled by Ed Dreby and Keith Helmuth, and published for Quaker Institute for the Future by Producciones de la Hamaca, Caye Caulker, BELIZE - 68 pages (2009). Climate change and energy futures are splitting the environmental movement. Some environmentalists now defend nuclear power from an ethical point of view. Others are appalled. Opinions differ over whether solar, wind, and other non-carbon energy technologies can keep the lights on. Some hold out hope for "clean coal" and deep earth storage of captured carbon. Others say this is economically unfeasible and dangerous. A rush to bio-fuels is touted as "green energy." Others see it as sacrifi cing food for fuel. Our energy future is stacked with technical options and policy dilemmas, but above all with ethical choices. In Fueling Our Future, Quakers expert in both the technical and ethical issues, provide key information, critical analysis and thoughtful dialogue on choices for our energy future. Fueling Our Future will assist concerned citizens in their evaluation of public policy and personal choices. The climate crises has now become a climate emergency. The widespread deterioration of systems that allow human settlement to flourish is a scientifically measurable and empirically observable reality. Scientific information about the disruption of the climate by our high-energy-comsuming civilization amounts to a new "revelation" about the human-earth relationship. New moral and ethical concerns require new thinking about how we relate to the earth and to each other. Under the weight of this reality, people within various religious communities are struggling to understand and reformulate the ethics of their world-view. Like those in many other faith communities, members of the Religious Society of Friends (Quakers) are pondering the ethical implications of various energy technologies with regard to climate change. In 2007 the Earthcare Working Group of Philadelphia Yearly Meeting (PYM) and Quaker Institute for the Future (QIF) began a series of consultations for discernment on three energy technologies—nuclear, coal, and biofuels. These three technologies were chosen for study because they are being promoted by various interests as essential to our energy future, but are the most ethically conflicted options before us. Sharp divisions of opinion and advocacy have emerged among Quakers on the proposed resurgence of nuclear power. For example, Friends Committee on National Legislation (FCNL) is on record as opposing the building of new nuclear power plants, as is Quaker Earthcare Witness. Other Friends insist that a rapid development of nuclear power is desperately needed to replace coal in order to reduce CO2 emissions. They build a strong ethical component into their argument. Many people are not sure what to think about the promotion of "clean coal" and biofuels, both of which involve important technical and ethical considerations that require deep scrutiny. FCNL has not taken a position on "clean" coal, coal gasification, or the development of biofuels in relation to energy policy and climate change, although the ethical considerations are significant and the public policy framework is rapidly evolving. This study was undertaken to provide information and informed analysis of these energy options, and to help those with differing and conflicting points of view about these technologies to have a better understanding and respect for one another’s views. Framed by Quaker values and testimonies, consultations for discernment were held at Harrisburg (PA) Monthly Meeting on April 14, 2007, at Friends Center in Philadelphia on June 7, 2007, and at Pendle Hill (Wallingford PA) August 21 –24, 2008. The aim of the discernment process reported here was not to create a unified voice or to advocate a particular position with regard to the energy options under scrutiny. The aim, in addition to laying out a certain amount of technical, economic, and social information, was to bring forward the assumptions behind the various positions that people take with regard to these energy technologies and the policies around them. Fueling Our Future is about advancing dialogue, not closing the argument. As will be clear in what follows, participants in the process were not neutral. We were in close agreement on some aspects of our discernment and divided on others—most notably nuclear power. We agreed on a set of framing principles that we advance as a context for further dialogue. We hope that others will find them to be a useful contribution to ethical decision making in this complex and conflicted arena. We have been asked why we did not focus more attention on the most hopeful energy options—non-carbon renewables. Our answer is that we found little disagreement or ethical quandary about most renewables, and there is a vast literature singing their praises and advancing their economics. The problem occurs with whether, and to what extent, nuclear, coal, and biofuels should play a continuing part in our energy support system, which is the focus of our discernment process and this report. The impetus for this study came from the Abolish Nuclear Weapons Working Group of Philadelphia Yearly Meeting and their concern with the linkage between the resurgence of nuclear power and nuclear weapons. As the idea for a discernment process emerged it became clear that this resurgence should be explored in the context of energy options and climate change, and in connection with FCNL’s linkage of preventing deadly conflict and energy policy. The planning and conducting of the consultations was handled by the Earthcare Working Group of PYM, and by the Circles of Discernment Program of Quaker Institute for the Future. We wish to thank the Chace Fund of Philadelphia Yearly Meeting, Elaine Emmi, and the Friends Testimonies and Economics Project for financial support, and Harrisburg Monthly Meeting for hosting the first consultation. We thank all the participants who generously and professionally entered into the consultations with a spirit of discernment and who shared our sense of urgency in grappling with the ethical contexts of these energy options. We especially thank Judy Lumb for the way she joined the process and employed her writing and editorial skills in the construction of Fueling Our Future. From the stack of tapes that recorded every session and the accumulation of notes that were folded into the record, she has crafted a document that distills the discernment process into an accessible report. We are grateful to Charles Blanchard, Phil Emmi, Geoff Garver, Patricia McBee, Robert McGahey, Marilyn Roper, Shelley Tanenbaum, and Marianna Wood for very helpful reviews that significantly improved Fueling Our Future. Quaker Institute for the Future Pamphlets aim to provide critical information and understanding born of careful discernment on social, economic, and ecological realities. Quaker Institute for the Future Pamphlets are inspired by the testimonies and values of the Religious Society of Friends (Quakers) and are based on a spiritual and ethical commitment to "right relationship" with Earth’s whole commonwealth of life. We live in a time when social and ecological issues are converging toward catastrophic breakdown. Human adaptation to social, economic and planetary realities must be re-thought and re-designed. Quaker Institute for the Future Pamphlets are dedicated to this calling and this task. The Quaker Institute for the Future (QIF) seeks to generate systematic insight, knowledge, and wisdom that can inform public policy and enable us to treat all humans, all communities of life, and the whole Earth as manifestations of the Divine. QIF creates the opportunity for Quaker scholars and practioners to apply the social and ecological intelligence of their disciplines within the context of Friends’ testimonies and the Quaker traditions of truth seeking and public service.